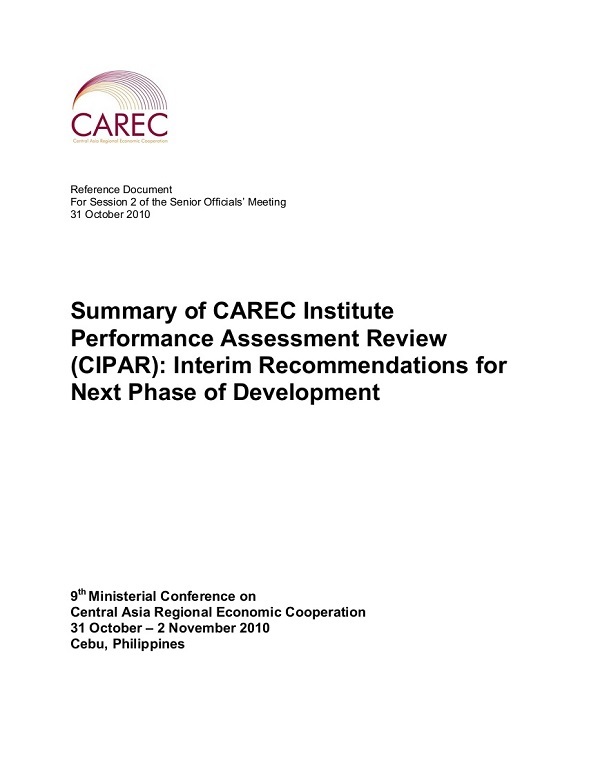 The CAREC Institute Performance Assessment Review (CIPAR) serves as an interim assessment for the purpose of eliciting guidance on the design of the Institute’s subsequent activities and programs. The CAREC Institute Performance Assessment Review (CIPAR) serves as an interim assessment for the purpose of eliciting guidance on the design of the Institute’s subsequent activities and programs. This exercise was conducted given the need to: (i) offer considerations for the Institute work plan for 2012–2014 and, (ii) complement the review of the overall CAREC Program’s strategic directions, as sought in the CAREC 10-year Commemorative Study.